There are some things I hope ring true throughout this blog, besides the obvious dollop of fun fashion and amateur DIY's. One of those things is my whole hearted appreciation of just down home good people. The kind when you meet, it's like you've been friends forever. The kind where you never have one of the all-to-familiar awkward moments and you leave actually leave a conversation rejuvenated.... and maybe one of you asked if you could be pen pals. What? That's normal for people my age, no? The ladies over at the magazine 'We Like We Love' are just that.... down home good people. Plus, they put together eleven of these all star work magazines, and I'm floored. The two leading ladies, Alyssa and Liz, are hard working ladies in their own right (and one a mama-to-be!) and in the 'just for fun on the side project' they can put together a gorgeous and fun magazine. What do I do in my 'just for fun on the side project' time? I make Halloween costumes out of children's tutus and clown nose poofs. We know who the obvious adults are here. 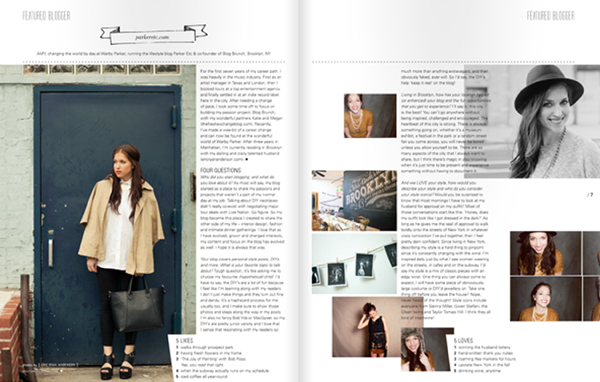 Fancy a peek around the magazine? We discussed some hard hitting questions..... like.... who lets me walk out of the house in some of my bizarre outfit choices and what do I in fact like, and what do I love. Which you wouldn't immediately find hard, until someone asks you to distinguish the two. Just try. Thanks for having me WLWL!